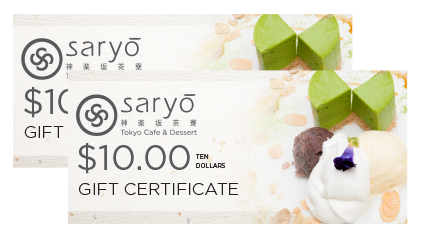 Saryo is one of the most famous Japan dessert shops – currently with over 9 different locations across Japan. Wishing to bring their beautiful & angelical desserts to other key cities in the world, Toronto has been selected as the stage for Saryo’s first overseas establishment. Now opening in North York, you can stop by anytime to take a little break from your busy schedule, and indulge in one (or a few!) of our signature desserts – whether it is the scrumptious parfait, rich matcha ice-cream, seasonal house-made cake, or the drooling matcha brownie. Work a little, rest a little, eat a little, sweeten a little, live a little. We look forward to meeting you at Saryo. In Saryo, we are dedicated to bring you more than just high quality and delicious Japanese-style desserts, but also to craft a space where you can enjoy a little moment, or simply just taking a dessert break. We are sure that you will find something on our menu that best serves your mood or craving.